All transactions are safe and secure with a reliable history in online purchasing behind each of our associates. Buy the Frank and Donnie t-shirt to own Donnie Darko clothing and merchandise. The Donnie Darko tee on the left displays Frank the Rabbit watching over Donnie Darko on the front. The creative design includes a silhouette image of Frank the Rabbit's head watching over Donnie in his skeleton costume. 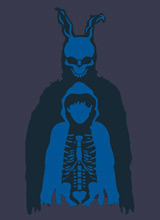 Pair it with a Donnie Darko movie poster to win over the fan in your life. This tee is available in over ten different colors. Not only is it perfect for fans of the movie, it's also great for those individuals who claim that they receive advice from a 6-foot-tall bunny named Frank. In addition to the Frank and Donnie tee above, browse the Donnie Darko Clothing Gallery for more apparel like men's and women's clothes, kids shirts or hoodies.